We received a lovely gift here at PCL from Steve Crichton, who offered to send along a collection of Scopitone music MP3s for more portable listening. Surely a song such as Jody Miller's The Race Is On loses a great deal without the go-go girls and their horsy-tails, but trust me, you'll thank yourself for downloading this one next time "High Boots" comes up on your iPod and you break out into uncontrollable giggles. tracks are still available today, and you won't find them included. However, if you would enjoy over an hour of out-of-print monophonic tunes that are slightly enhanced despite their vintage audio flaws, now is your chance to enjoy the glorious awfulness and genius. Sorry folks, these are just English Tones, and you may not recognize them without the typical Scopitone hiss! However, in light of the poor source recordings, these files may not be ideal for headphone scrutiny. Regardless, this collection is probably the best available and worth a listen if you're a fan. What a great share! Thank you! Hey! I saw one of these when I was a kid. 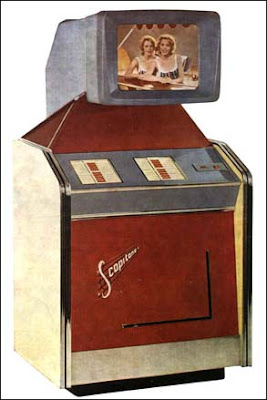 Around 1964, we were at our regular vacation spot, Camp Warneke, in New Braunsfels, Texas, and the Greman cafe and dance hall called Schrumkrud's had one of these. Could say my first music video experience was a hot polka number. Warpped me 'till this very day! "If Thine Eye Offends Thee -"
Dr. Lou: "Feature Vodvil Act"
"Promise her anything, but give her Synth Coke©." "Radio Psychic with the Mystic Television Eyes"
Ride That Slim Pony. Or Ride That Pony, Slim. "with built-in scalp that LOOKS likes skin!" Why is James Chance So Misty-Eyed? Spread Your Butter on My Toast! Ange's Favorite Sauce - for her to poop on!